A good Minestrone Soup is almost like the perfect meal, isn’t it? Something about all those greens, beans, and veggies swimming together in an Italian tomato broth…mmm perfect. 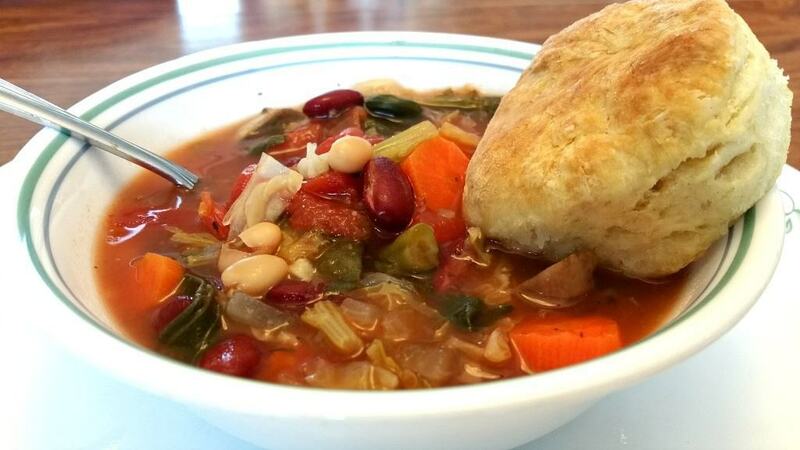 I think this was one of my very first soups I made when I became a Brand New Vegan, and it’s still one of my favorites. According to Wikipedia, Minestrone is now known in Italy as belonging to the style of cooking called “cucina povera” – which literally translates as “poor kitchen”. If this is what the poor peasants ate, I say let those rich nobles enjoy their artery clogging meats and cheeses, because to me, this looks delicious, not to mention healthy! 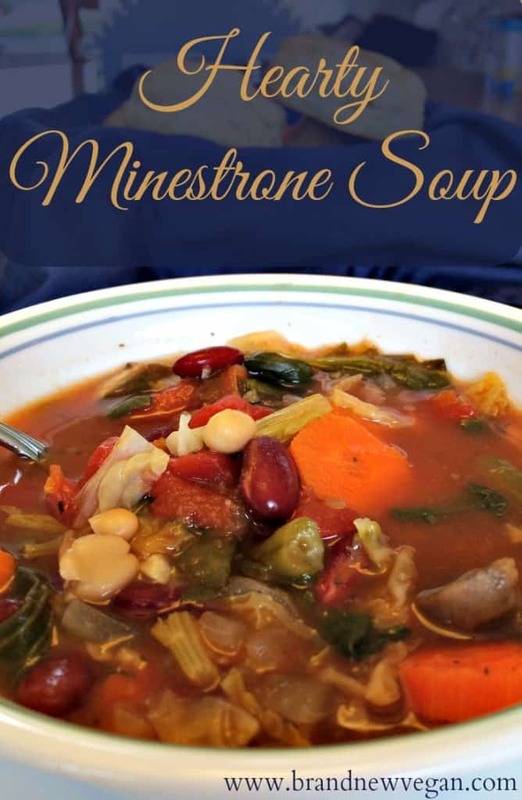 The nice thing about Minestrone is the variety of veggies you can use. Of course as with any homemade soup, the French mirepoix of carrots, onion, and celery form the base, but to that – you can literally add anything. I added mushrooms, savoy cabbage, spinach, garlic, tomatoes, 3 different kinds of beans, veggie stock, and of course – Italian Seasonings. This soup literally screams nutrition! To make this soup simply sauté the onions, garlic, carrots, and celery until softened. Then add the mushrooms and cabbage until they have released their liquid and wilted. Finally add the tomatoes, stock, water, beans, and seasonings and bring to a boil. 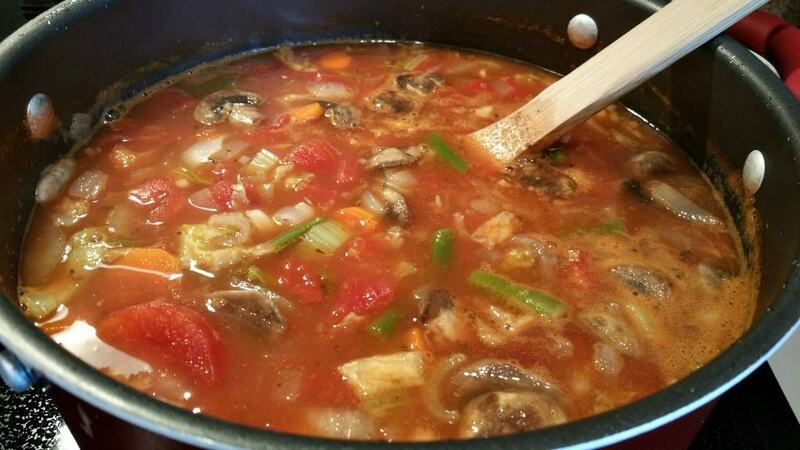 Once it comes to a boil, turn down the heat and simmer for 1 hr to let the flavors blend. Right before serving, add a few handfuls of freshly chopped spinach and stir it in. And of course the perfect accompaniment would be some hot, flaky, vegan buttermilk biscuits! 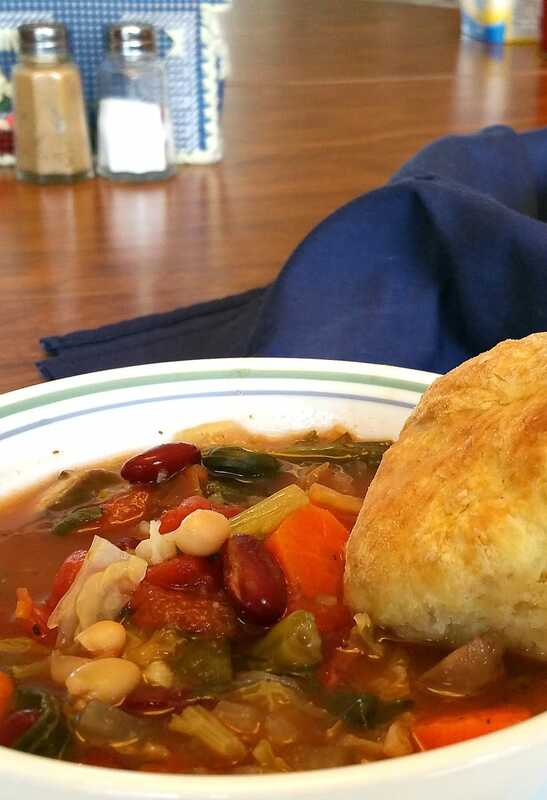 And yes, you can find My Flaky Vegan Biscuit recipe right here. 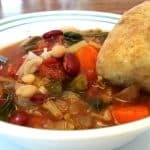 A hearty Italian Minestrone Soup full of vegetables, 3 different kinds of beans, and fresh greens that just screams nutritious. Buon appetito! Do you rinse the canned beans? Usually – especially if they are full sodium beans. If they are the low-salt variety then no as I don’t add any other salt to the recipe so they give it just a little. I made this today and it is so flavorful! Of course, I made a huge pot and will need to freeze several servings. I did NOT put cabbage, mushrooms, nor spinach in it. Is it ok to freeze? Yes, it should freeze fine. Chuck…I see Pinterest buttons on your recipes but I cannot get them to work. This one and the onion rings were the last two I tried with no luck…anyone else? Does anything at all happen? I love this recipe! Two things I have been doing that are a little different but great adds… I chop a small head of fennel and add with the miripoix. Great flavor! and for some of the broth I substitute what I call tomato “plasma.” I cook whole garden fresh ripe tomatoes for sauce and ladle off the golden broth they release before I break up the whole tomatoes. Nirvana!!!! I have not converted this to the Instant Pot yet……sorry…. If you do, let me know. I’ve been meaning to follow up and tell you that I make this regularly in my pressure cooker. 15 minutes on the soup setting is perfect. I love this recipe because it’s so versatile. If I don’t have all the specific veggies, I just add more of whatever I have on hand. I’ve also added zucchini and broccoli. I usually have to add extra veggie broth or it’s a little thick. So good and a family favorite. 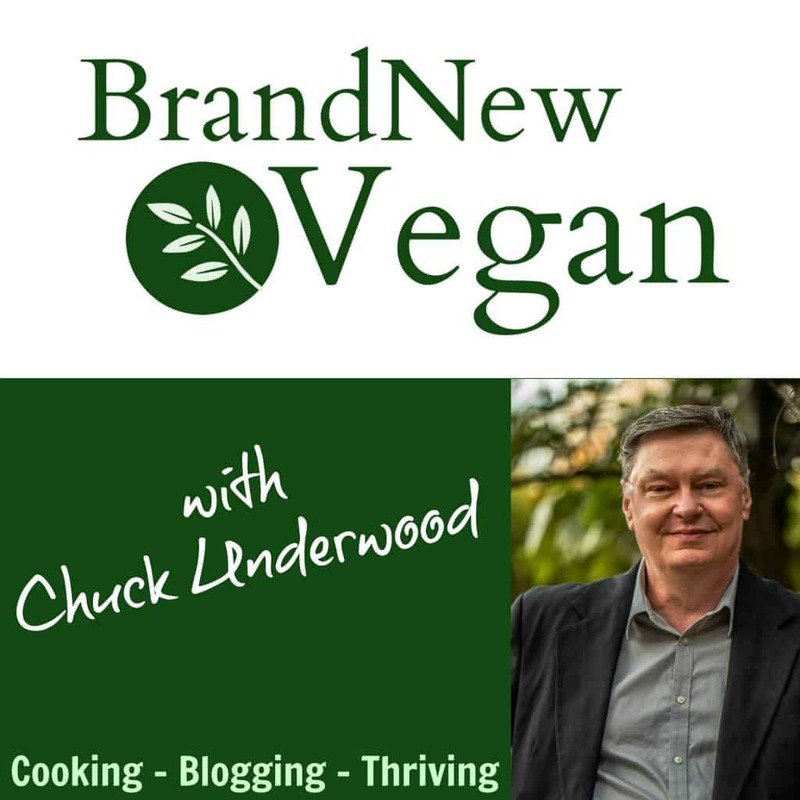 Chuck, I followed this recipe as written and, WOW! So hearty and flavorful! This one is a real keeper (but then you have LOTS of those!) Thank you for this recipe! Perfect for a cool winter evening! I was in the mood for a minestrone. This one hit the spot!! Even my non-WFPB family members loved it! When do you add the red wine vinegar? thank you! I usually add it at the very end, right before serving.